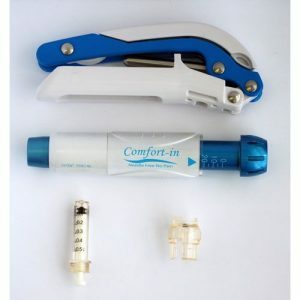 A revolution in injection technology has occurred with the development of the needle-free injector which may be used to administer our range of methylcobalamin, HCG and erectile dysfunction injections.The injector utilises high pressure, produced via an inbuilt spring, to force the liquid injection mixture through the skin between superficial skin cells into the tissue below in a fraction of a second. The mixture penetrates to a depth of around 0.9cm which is sufficient for subcutaneous injections and for the treatment of ED. Needle free injections help overcome the fear and hesitation of using an injection as no needle is used. We were one of the first in the country to introduce new needle free injections.